Jonathan Swift's moral and political satires astonished his contemporaries and still have the power to disturb, with their compelling images and unsettling turns of argument, and to delight, with their charm and inventive wit. A Preface to Swift examines the complex appeal of this fierce critic of oppression. While thematically arranged, the text follows a broadly chronological account of Swift's life to show his development as a writer from the prolific and inventive iconoclast to the mature satirist whose enduring memory of past events produced warm friendship as well as strong resentment. It considers in detail his engagement with the corruption of over-secure politicians and his opposition to the easy rationalism of free-thinking pundits. Gulliver's Travels is shown to be a coherent critique of eighteenth-century ideas of science, education and politics in which the order of the books ('the progress of the fable') is highly significant for its whole meaning. 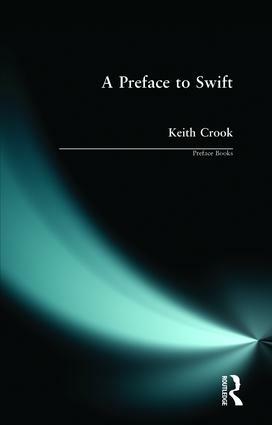 While this is a major focus, Keith Crook also discusses a wide range of Swift's other works, including his early satires, his political writings, his poems and his letters. Detailed chronological charts place his life and works in the political and cultural context, and illustrations have been chosen with commentaries to extend the reader's sense of Swift's connections with London, Ireland and his contemporaries. This will be a particularly useful introduction to students who are studying satire as a genre; the early eighteenth-century literary, scientific, philosophical and political context; the representation of women; the political relation of Ireland to England; and the position of the artist within society, especially in connection with the levers of power. Political parties and issue groups. Swift's change of direction. Swift's definitions of party. Harley's patronage. St. John and Harley. "The Examiner". "The Conduct of the Allies". End of the ministry. Preferment: Bolingbroke and Oxford's treatment of Swift. Bolingbroke on Swift. Oxford and Swift. Oxford's contribution to politics. Female schooling. Sexual intimacy. Poems to Stella. "To Stella, Visiting me in my Sickness", 1720?. "To Stella, Who Collected and Transcribed his Poems", 1720?. Vanessa at arm's length. The question of morbidity and scatological coarseness. The morbid poems. "Death and Daphne". "A Beautiful Young Nymph Going to Bed"
The scatological poems. "The Lady's Dressing room", 1732. "Stephon and Chloe", 1731. "Mary the Cook-Maid's Letter to Dr Sheridan", 1718. 5. Swift and Contemporary Ideas. The Royal Society. Travelogues and 'my cousin Dampier'. Locke: society and contract. Science and language. Locke: empirical philosophy. Language in "Gulliver's Travels". Imagination in "Gullivers's Travels". The progress of the fable. Part 2: Critical Survey.